Nikon today introduced another model in the Nikon 1 lineup, the waterproof, freeze proof, and shockproof AW1. Along with the camera Nikon redesigned two of the Nikon lenses to also be waterproof, the new AW 10mm f/2.8 and AW 11-27.5mm f/3.5-5.6. Rumors of the "new Nikonos" have been lingering in the Nikon world for several years, ever since one of the Nikon executives hinted that Nikon would return to the underwater camera system space. The AW1 is the camera that has been hinted at. The AW1 is waterproof to depths of 15m (49 feet). It is freeze proof to -10°C (14°F). And it is shockproof in drops of up to 2m (6.6 feet). Rubber seals protect the inside of the camera, including an O-ring at the lens mount. 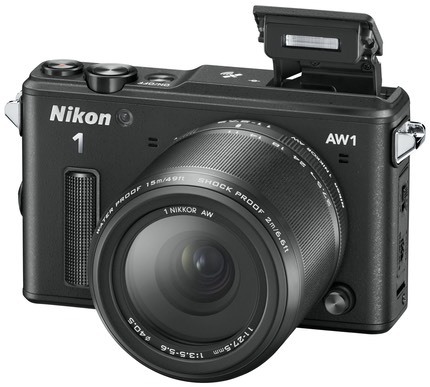 Overall, the AW1 is basically another model in the J series, only a little bulkier and with some minor additions (built-in GPS/GLONASS, Nikon's clunky Action Control [though this may be less clunky when trying to set things underwater], an optional silicon skin for better gripping when wet, the internal flash is waterproof, and a new underwater white balance setting). In terms of other specifications, the AW1 is basically the same as the J3 model. The new lenses only mount on the AW1 model. Their waterproof flange prevents them from mounting on other Nikon 1 cameras. On the other hand, all other Nikon 1 lenses will fit on the AW1, they just won't confer waterproofness to the combination. Nikon says they're working on a waterproof Speedlight model for the AW1, as well. At US$799 for the AW1 plus 11-27.5mm lens, the cost is still a bit on the high side, especially considering we're still talking about a non-VR lens. 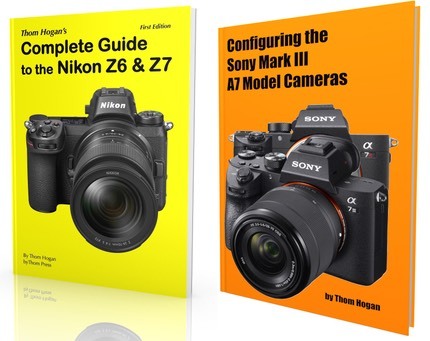 Moreover, I'm concerned about how Nikon will decide whether or not you stepped outside the parameters of the design if you have to return the camera for repair. Nikon is notorious for citing user abuse, and the parameter for shockproof is mighty close to the distance a tall person might accidentally drop the camera. I have to wonder whether or not the camera records maximum depth or acceleration into internal memory (technically, GPS shouldn't penetrate water, though Nikon's marketing materials currently claim that the camera can record depth and this is mentioned in conjunction with the GPS info; there could be pressure and shock sensors in the camera). The AW1 is certainly an interesting addition to the mirrorless world, and it's nice to see Nikon return to one of its heritage product types. Having a compact-type camera with some reasonable performance attributes and raw capability that can be considered a "knockabout" type that doesn't require a lot of attention in tough environments like beaches or glaciers or even just backyard pools is something we've needed for awhile. On the other hand, Nikon has missed one key component of this kind of camera: larger, more prominent controls. Think about it: if you're taking pictures at 14°F, how likely is it that you're wearing gloves? ;~) The same is true for some snorkeling and shallow diving. I'll very likely be taking an AW1 on my Galapagos photo workshop early next year, which should be a perfect test for its toughness and water abilities.